Kamala Purnaiya Taylor, a.k.a, Kamala Markandaya, the late Indian internationally bestselling author, had penned a terrific yet extremely honest tale of a woman's struggling yet endearing life right after India's independence in her book, Nectar in a Sieve which marks as a pioneering book in Indian literature, that outlines the importance of a woman's simplicity, her sacrifices, her unconditional love for her family, her dying desires, her struggles during the times of poverty and her intelligence in rural India. This beautiful and eloquent story tells of a simple peasant woman in a primitive village in India whose whole life was a gallant and persistent battle to care for those she loved. Rukmani, a very young girl, is married off to a simple peasant, Nathan, from a village miles and miles away from the village where she was born, by her father, who is a reputed village headman. Rukmani who came from a modest and affluent lifestyle is expected to follow with her newly married husband to his village and into his simple world with limited means. Rukmani soon adjusts and adapts with her new lifestyle as a village farmer's wife, by helping her husband in sowing the rice seeds, watering and other necessary farming activities while handling and managing the household singlehandedly. Unfortunately as time passes by, Rukmani is left childless as she is expected to give birth to a handful of sons who will finally help in the farming business alongside with her husband. As a result, Rukmani consults a Western doctor, Kenny, with modern world ideals, who finally helps her to give birth to a daughter and four sons. Despite the increase of so many feeding mouths, Nathan and Rukmani somehow manages to feed their sons and daughter, give a fulfilling life, even they are challenged all the way with poverty, drought and flood, sacrifice their farm and fight lots of battles, and through out the whole journey, Rukmani stands tall and strong shoulder-to-shoulder with her husband until the very end. There are so many stories that highlight an India's life right after the independence but only a few stand out, just like, Nectar in a Sieve is one such ground breaking classic Indian literature that brings out the basic and simple life of a farmer somewhere rural in South India. Centralizing poverty as the main theme of the book, the author had depicted the life of a village woman despite whose sadness knew no limit, she had a fulfilling and satisfying family life with limited happiness and extreme challenges all through out her way. The author has made her readers feel nostalgia through the pages of this compelling yet heart touching story of a woman as a little girl, as a daughter, as a wife, as a mother and as a friend as she survives her life alongside her husband and children. The author has captured the backdrop of a post-Independent India strikingly as she gracefully painted the rough and brown yet dull landscape of an Indian village, lush with rice paddy fields and the blooming flora here and there, the dust from the red stone roads, the grayish river, the hard cracked soil, the mud huts, the narrow-minded and illiterate village folks, the superstitions, the child's cry, the staple food, and the sweat of the hard working villagers. Each and every details about the background image will let the readers to time travel back and forth from that era to the modern times and that will force them to reflect back on the changes. The author had also highlighted the socio political, cultural norms and beliefs followed back in that era which is in a stark contrast to present day's rules and beliefs. The author's writing style is extremely significant rich with emotions and wisdom embedded deep into the core of the story line. The readers, be them international or Indian, will find the book easy to comprehend with even the story is written by the author is a very simple and easy to understand English language. The narrative is heartfelt and articulate and the readers will find losing themselves into the sad undertone of the character's voices. The pace if the book is swift and moderate even the story is rich with so many evocative descriptions that will help the readers to not only feel the story but also to visually imagine the scenes right before their eyes. The characters reflect the hardships toiled by the Indian farmers and their family through their honest and realistic demeanor strikingly. The main character of Rukmani is pleasingly portrayed that the Indian readers can easily contemplated with her plain looks, not so sharp wit, an enduring and patient woman, a hard working mother, a loyal and devoted wife and an obedient daughter. Rukmani infers poignancy and sympathy through her painful journey of life in India, how motherhood and marital life changes the life of this once innocent and sweet little girl is equally heart breaking yet enlightening enough to keep the readers glued to the pages of this book till the very end. the supporting characters are well developed and extremely enriching enough to keep the readers interested about the way their life unfolds through the main story line. In a nutshell, this is a must read Indian book that every Indian readers must not only possess in their bookshelves but must also possess in the very deep of their souls. Verdict: Satisfying and poignant till the very end. Pseudonym used by Kamala Purnaiya Taylor, an Indian novelist and journalist. A native of Mysore, India, Markandaya was a graduate of Madras University, and afterwards published several short stories in Indian newspapers. After India declared its independence, Markandaya moved to Britain, though she still labeled herself an Indian expatriate long afterwards. 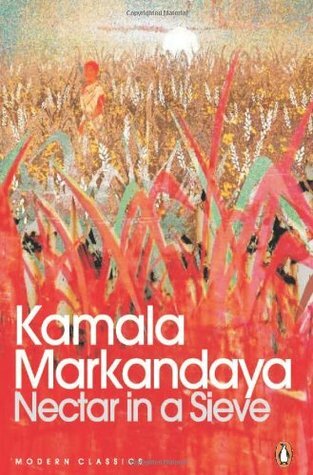 Kamala Markandaya belonged to that pioneering group of Indian women writers who made their mark not just through their subject matter, but also through their fluid, polished literary style. "Nectar in a Sieve" was her first published work, and its depiction of rural India and the suffering of farmers made it popular in the West. This was followed by other fiction that dramatized the Quit India movement in 1942, the clash between East and West and the tragedy that resulted from it, or the problems facing ordinary middle-class Indians—making a living, finding inner peace, coping with modern technology and its effects on the poor.